Whisk together the vinegar, honey, mustard, chopped thyme and some salt and pepper in a medium bowl. Slowly whisk in the olive oil until emulsified.Heat a charcoal or gas grill to high for direct grilling. Brush the eggplant, poblanos and bell pepper with canola oil, scatter over some of the whole thyme leave sand season with salt and pepper. Grill the poblanos and bell pepper until charred all over and somewhat tender, about 5 minutes. Remove from the grill to a bowl, cover with plastic wrap and let steam. 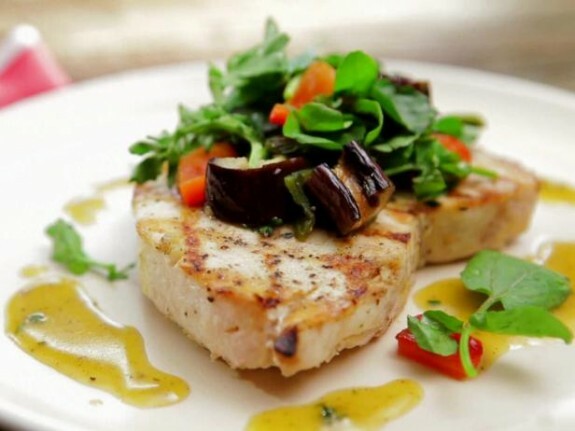 Continue to grill the eggplant until charred on both sides and tender, 5 to 8 minutes.Brush the swordfish on all sides with canola oil, scatter the remaining whole thyme leaves on both sides and sprinkle with salt and pepper. Grill the swordfish until charred on both sides and just cooked through, about 5 minutes per side, depending on thickness. Peel, seed and dice the poblanos and bell pepper and transfer to a large bowl. Season with salt and pepper. Add the watercress. Pour some of the dressing around the sides of the bowl, and toss to dress the vegetables. Put the fish on a large platter. Drizzle over the remaining dressing and top with the salad. Serve.